Killer Food Plots owner Nick Percy joins me today for a very important episode titled “Last Minute Food Plots”. Easy and quick methods. 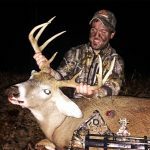 ← #16 – Mark Buxton – Southeastern Habitat, Native Forage, Being Site Specific, Trapping, Strip Discing, Knowing Where Your Deer Are, Fire & Hunting When It’s Right.